Lock up your drinks cabinets, Charlie Sheen and Lindsay Lohan look like an item. That was by far the scariest concept on offer at the premiere of the latest (the fifth) tired revival of the Scary Movie franchise, when Hollywood’s greatest hellraisers, male and female divisions, clutched each other amorously (or maybe just for support) on the red carpet. They have roles in the movie (but don’t expect us to watch it to find out how substantial) which explains their presence at the premiere. Actually, maybe the beautiful friendship is all part of the Hollywood therapy process. 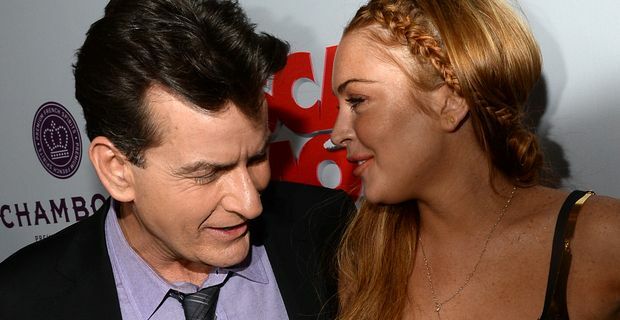 Sheen is adept at speaking the rehab language and has said that he feels a kinship with Lohan, and "wants to be her mentor whether she wants one or not." Preposterously Sheen seems to believe he can offer some lessons in maintaining your dignity in public. "She can continue to hang out with her dress shredding club buddies," he said, "or turn to me for some advice from a guy who's been down the road as well as every other side trail on the journey." That was a rather bitter reference to an ankle-length designer dress Sheen gave Lohan as a gift, only for her to hack it to a more feisty thigh-length. Part of the mantra of rehab is that you have to recognise you have a problem and want to change. Lohan seems to be still a little undecided judging from her recent appearance on the Letterman show. "Aren't you supposed to be in rehab now?" the talk show host asked. She pointed out that there was no urgency and that she would be checking in at the start of May. Lohan and Sheen met recording an episode of his Anger Management show. Sheen defended her reputation – up to a point. "Day one, she was on time, she knew her lines, hit every mark, made us look off our game," he said ". . . And then we had to deal with day two."